The man who sold us this house told us he had bought it the previous month from a cousin in trouble. He told us his cousin hit bottom in a nasty divorce. He told us, as we signed paperwork at the title company, that he is an Air Force veteran; that he served in Desert Storm and declined an invitation to enter the current war. All lies, everything that man told us about himself, his cousin, the brutal divorce. But he told no lies about the house. “What you see is what you get,” he said, and we saw a heap of work with a pile of potential. We saw a house with a long history we knew we could never fully divine. But that was OK. We would learn some things along the way; to other questions, we would forever imagine the answers. Our neighbors fill us in, little by little, with the history they know. The owner before the liar was not his cousin; he was just a young man who couldn’t afford to pay his bills. And the owner before him was an old Spanish man who filled the yard with grapes, grapes everywhere in this fertile soil. He made wine for a large extended family. This explains the voluntary fruits that have populated our yard in various spotsâ€”along the southern fence, out back by the apple tree and around that mysterious pit. It makes sense, so many grapes in the Rio Grande bosque. Now here’s a fascinating tidbit: New Mexico is the oldest wine-growing region in in the country. The first missionaries planted grapes in this river valley in 1629, 140 years before the first vines took root in California. Many of today’s New Mexican vineyards are growing grapes that hail from those planted in centuries past. And at least one winery uses an ancient irrigation system that watered Anasazi crops more than 1,000 years ago. And here we are today, with the old man’s grapes coming back to delight us. What a pleasant story, no? So we thought for the first week after hearing it. Then we heard the old man was, apparently, a pervert who watched the little neighbor girls with most unsavory eyes. And that’s the thing about stories, about life. Rarely are they black and white; rarely are they thoroughly good or thoroughly bad. Perhaps it’s true, and I would have despised the man’s character, had I met him. But he is gone and his grapes remain. Those, I will enjoy. Winemaking in New Mexico has enormous potential. Gruet of course is well-known and has a strong presence in the national market. At higher altitudes (much higher than where you probably are), in New Mexico and in neighboring Arizona, superb wines can be produced. (And of course, the best wines are produced in INFERTILE soil). One of my favorite American wineries, Dos Cabezas, is in Arizona. 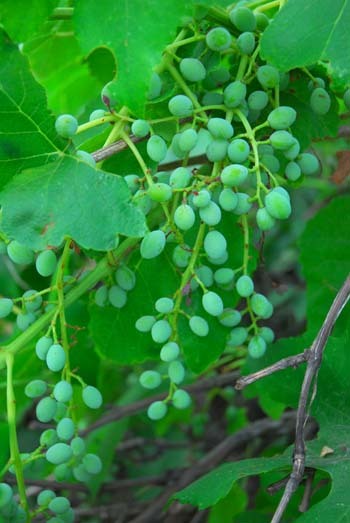 You might find more alluring mysteries in trying to identify the grape varieties in your garden. Depending on how old the vines are, you might end up discovering unusual forgotten varieties that might have been brought in from some obscure corner of the old world. Richard, yes, the grapes are at this point a mystery. We shall see what comes along, but you’re right. I suspect we may have some very old and intriguing varieties.